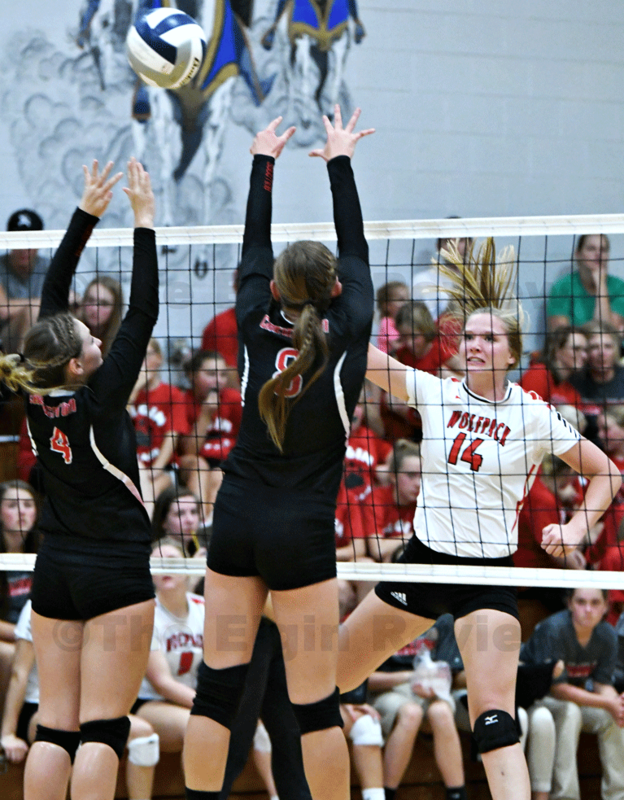 Lydia Behnk fires a ball over the outstretched blockers’ hands. The EPPJ Wolfpack volleyball team got another win last night, defeating Creighton by taking 3 out of 5 sets. The hot gym was a factor for both teams. Temperatures during the day were in the mid-90s and volleyballs and areas of the floor needed to be wiped up several times as sweat poured down the players’ faces. Both teams fought through it, many times playing inspired volleyball. The Wolfpack easily won sets 1 and 2, then Creighton fired back and took sets 3 and 4. Fortunately for the Wolfpack, their most inspired play came in the final, pivotal 5th set. They buried Creighton and buried them early, racking up 7 points before Creighton put one on the scoreboard. The Wolfpack’s attack was relentless and Creighton ended the 5th set with only 4 points. Here, Coach Tina Thiele-Blecher and seniors Lydia Behnk and Grace Henn talk about the match. The team is on the road next week, playing in a triangular at Nebraska Christian on the 21st.